Record numbers of older people are embracing social media and smart technology, according to a report from watchdog Ofcom. But many of them remain wary of about using the internet, with a fifth of over-65s saying they are not confident online. Despite that, four in 10 baby-boomers – aged 65 to 74 – use a smartphone. Nearly half of net users in the same age group now have a social media profile. About nine in 10 of those opt for a Facebook account, with only 6% choosing WhatsApp and 1% signing up for Instagram. Most of the older age group – over-75s – say they have no plans to go online. 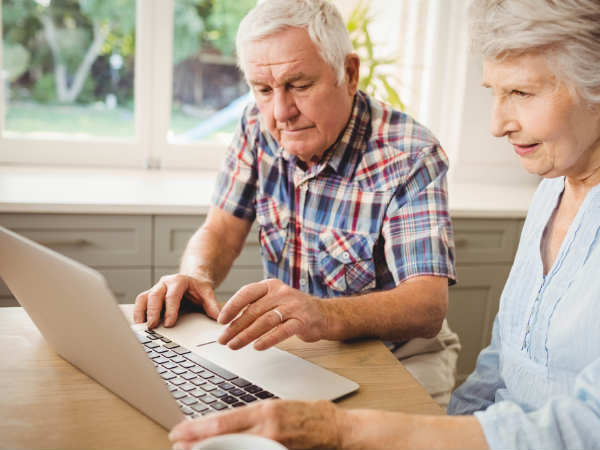 Although older adults were increasingly connected, they still spent less than half the amount of time online that the younger generation did, the report found. Over-65s spent 15 hours online each week, compared with 32 hours spent online among the 16-24 age group. When questioned about some of the big issues such as data privacy, a significant number (16%) of over-55s said they never considered it. Less than half (46%) felt able to identify sponsored links in search engines, with only three in 10 over-75s and four in 10 65-74s aware of personalised advertising. “But some older people lack confidence online, or struggle to navigate search results. The findings are from Ofcom’s annual adult media literacy report. Beware of links and attachments in emails. Strong, unique passwords are key. More information on passwords can be found on the Get Safe Online website. Always check for https when entering personal details onto a website. If you are ever unsure about something online, do a background check via trusted websites and social media. Ensure you have an up-to-date anti-virus software on your devices. Be safe on all devices, including computers, laptops, tablets and smartphones. There is a risk of cyber crime on all these devices. Update your device software as soon as it asks you to, this will protect your device from the latest threats. Be careful with how much information you share when connected to public Wi-Fi. Be social media savvy – update your privacy settings on these sites, and do not post when you are away on holiday on these sites! Report it. Contact Action Fraud for any issues relating to scams, fraud and viruses. Report directly to social media websites when issues arise on these platforms. If you are threatened with physical harm, or are a victim of any online sexual offences, report to the Police. If you would like support as a result of becoming a victim of any crime, contact Victim Support on 01926 682 693.